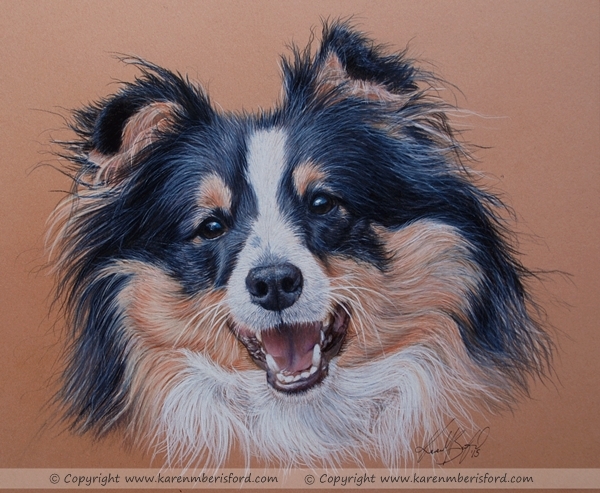 ​Jaxx is the 4th Shetland Sheepdog portrait I created for the family. After they lost SAM in 2014, Jaxx came into the fold to join the 2 little girls, LEXI and KENZI. As I previously did, I took my camera up to meet Jaxx and although the day was hot and very sunny, I managed to capture this image which we all felt would compliment the previous portraits already hanging in their home. As the photo shoot was taken under difficult photographic conditions on the day, I was unable to get the perfect balance of detail, colour and tone and so used other photographs to ensure I got the right balance. The whites are quite over exposed from the sun and this can also lighten fur colouration too. Pose wise, this was a good choice as he looks a lovely, happy dog and a perfect match for the other 3 portraits completed last year.